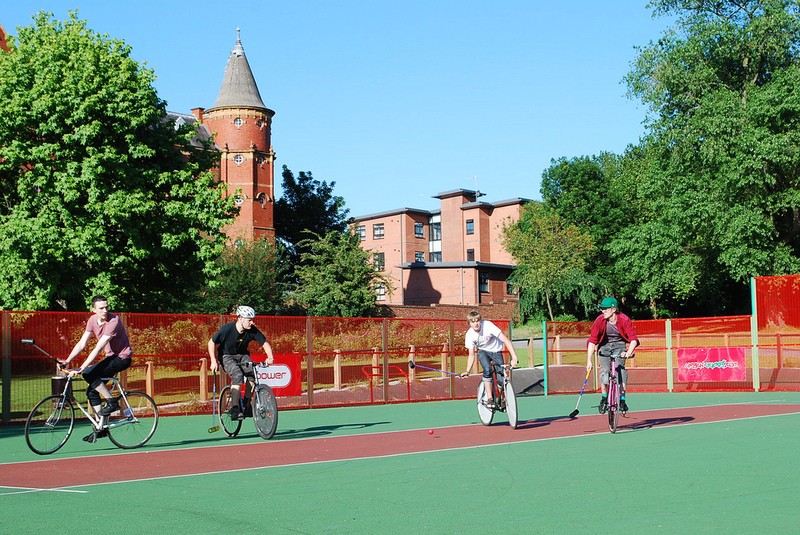 Passing and Shooting | Birmingham Hardcourt Bike Polo, UK. One of the consequences of trying to play more team games is an increased focus on tactics and individual positions or roles. I got myself thinking about what I see are my strengths and weaknesses, and the kind of game I like to play. It seemed to me that in lots of ballgames there are partnerships between ‘playmakers’ and ‘goalscorers’, and I asked which I would like to be. Immediately, I thought about my unabashed joy when I score a goal. Any of them are satisfying, from a close-range tap-in, to a long-range, spoke/valve-breaking, first time slapshot wheelie-goal (I may not actually have done one of those, but I can imagine the combination). Obviously polo is about scoring more goals than the opposition, so it’s a valuable role, perhaps the most valuable, as defenders/goalies can’t win you games, they can only prevent you losing. Then I started thinking about making nice passes. They’re harder to judge than goals (many times in Birmingham people say ‘Nice pass’ or whatever, despite the fact that it didn’t reach its target!) and it’s hard to say who made the pass work, the passer or the receiver? It’s definitely pleasing to spot a gap, which a teammate also sees, pass into it and have the space filled and ball collected by said teammate. 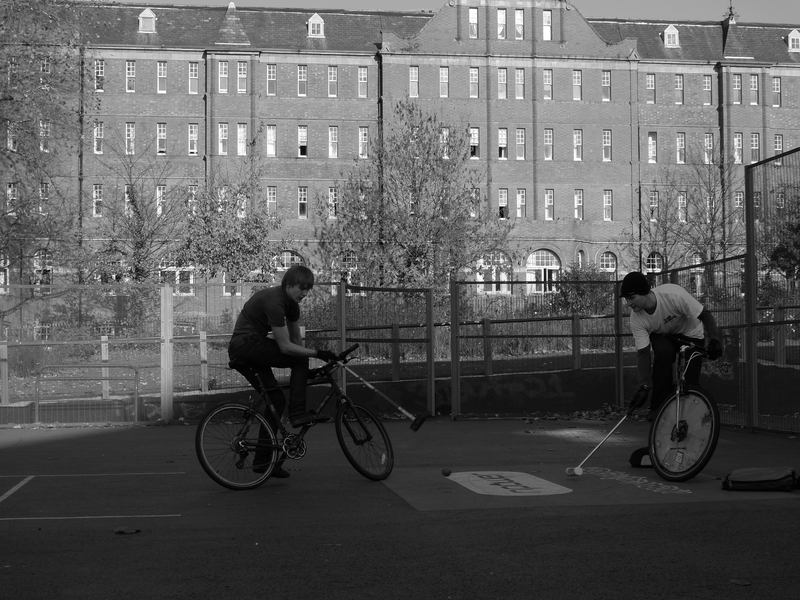 I got to thinking that passing is more interesting because it’s a relationship between two separate brains and bikes and mallets and the target is always moving. The goal is always where it is, you just have to find the gap. A visionary pass is a beautiful thing. Even better if it results in a goal. Of all the people who play in Birmingham, I think Matt is the best at receiving passes. Sometimes it is so easy to see where he is going to go, and it amazes me how easy it is to make the play, which often results in a goal. I think a lot of us could improve this aspect of the game, especially making sure to pass in front of people, or to where they will be rather than where they are. The way we call for passes doesn’t help, as it’s always too late, and often just helps the opposition know what you’re going to do. I think it’s a good habit to think about your strengths and weaknesses, and decide if you’re a ‘finisher’ or a ‘possessor’ (or if you can do both or neither!). If I were coaching Ill Pigs I’d tell Andy to focus on his fast-breaks, hold possession and set up attacks and I’d have Matt always lurking around waiting for that killer pass to whack into goal. 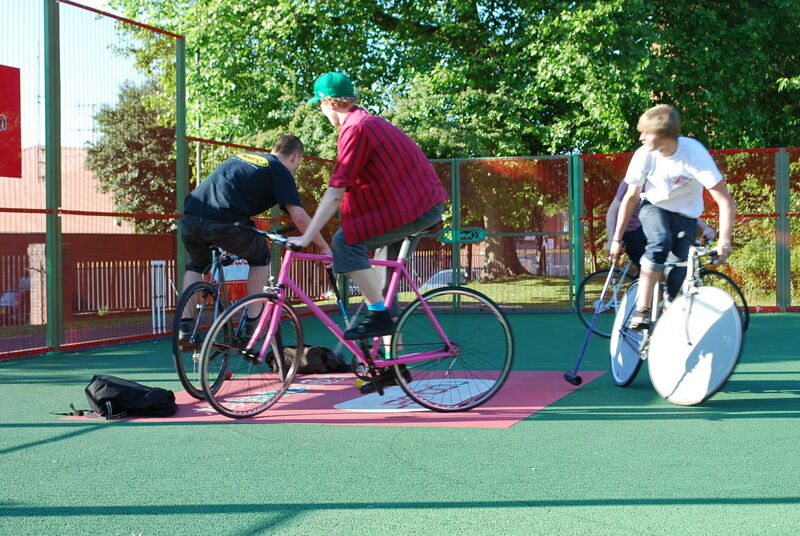 This entry was posted in Birmingham Bike Polo and tagged bicycle polo, bike polo, birmingham bicycle polo, birmingham bike polo, birmingham polo, dividenthal, london bike polo, polo. Bookmark the permalink. I searched my RSS feeds for ‘Birmingham shooting’ and found this! Somewhat less depressing than murder.